I started out last week with an email from Deborah at Whipstitch who was looking to help out a local designer who needed a couple of "emergency quilts" made to display at Quilt Market this past weekend. I'll share more details after the show is over and I get a couple photos of the booth but I ended up making two baby quilts (about 40x60) with some very cute baby fabric in about 48 hours. Yes, you read that right, 2 complete quilts from start to finish in 48 hours. Now they weren't fancy but I was really pleased that I could get them done and help out an artist/designer in need. Plus there was the added benefit of knowing that something I MADE was hanging at Quilt Market. My dream is to get there in person one of these years so this seemed like an awesome opportunity to get at least one tiny toe in the door. Pushing myself to get those quilts done that quickly made me realize how absolutely ridiculous it is that I have so many things on my UFO (unfinished objects) pile *this close* to being completed. So it's given me a push to get that pile moving! I was a bit nervous about trying to make the continuous bias tape that I needed for my Heather Bailey quilt but with the directions in Deborah's book, the fact that the very kind Diana at Whipstitch walked me through the process one Saturday at Whipstitch and using the photos in Make it Modern's continuous bias tape tutorial I bit the bullet and went for it. I used one yard of a tomato-y Kona red and ended up with SIXTEEN yards of bias tape! SWEET! More than enough for my quilt binding with some left over. It's already pinned on and just waiting for nap time to get sewn. Up this week: finish the Heather Bailey quilt, bind the Anna Maria Horner quilt and new pajama pants for our lovely fall weather that finally arrived! I'll be posting pictures of what I get finished on Friday and linking them to Crazy Mom Quilts new Finish It Up Friday feature. Have a great week! SEW excited to sew on Saturday! Sorry, I couldn't resist ;-) The Atlanta Modern Sewing Guild's sewing day is THIS Saturday at Whipstitch from 8am till noon - we're going to be making Anna Maria Horner's Figuring the Eight Scarf - just in time for this weekend's cool weather! You can find the FREE pattern on Anna Maria's blog under the Make section. 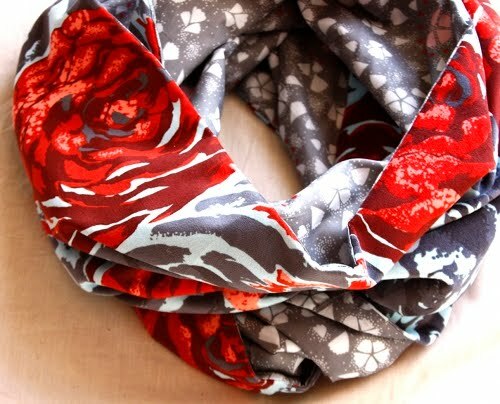 I made this scarf last winter and loved it - it goes together super quickly and looks amazing. You can use heavier fabric like velveteen for winter months or use a lighter fabric like voile for longer wearing options. This would also make an amazing gift for the holidays! Whipstitch has a ton of gorgeous fabric to choose from or you can always bring your own and sew with us! Also at Whipstitch TONIGHT 6:30 - 9pm - Book Signing with Kelly McCants for her Sewing With Oilcloth book. I'm planning on going and I'm looking forward to picking up same laminated cotton to make the doodlebug an apron to wear when crafting - because you know when you're two you really put your heart and soul into your art...teehee! This is the pouch I made for my partner in the Pretty Little Pouch Swap this round - she asked for a pouch large enough to hold a sewing project she's working on. I saw one of these on My Sewcial Hour and loved it - I want to make one for myself now too! I used the hoop bag pattern from Frosted Pumpkin Stitchery and kind of made mine the same patch-worky way as the original one I saw. I used a charm pack of Sophie by Moda - I just think it's got a lot of pretty, fresh colors that hopefully my partner will like. I also enclosed a new charm pack of the same fabric for her to play with! 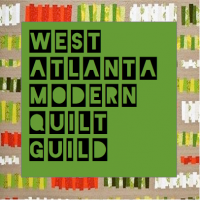 Oh and NEXT SATURDAY is our Atlanta Modern Sewing Guild Project Day, where we all get together and work on a great project together, at Whipstitch Fabrics from 8AM - noon. Our project is the Anna Maria Horner Figure 8 (or Infinity) Scarf - super easy, CUTE and FREE (pattern anyway) for the cold weather I'm hoping we'll be getting soon :-) Come join us! Another 3x6 test block - to try to get it big enough, so this one? Yeah, 13 inches. The most beautiful block that I HATE. Why in the world did I think I could make a 4x4 square block end up at 12 1/2 inches? Enter the Greek Cross Block from the Summer Sampler Series - math already figured out so each and every block ends up a blissful 12 1/2 inches! Big sigh of happiness. And a HUGE THANK YOU to all those who figured out the math already. Thankfully I didn't cut any of the fabric I chose for my first choice blocks so now I can TRULY get to work on my 3x6 blocks (which are due in one short week). But this block went together very quickly I'm thrilled to say, so they'll be in the mail by the deadline! This weekend: dinner and a movie sans Doodlebug thanks to Nana and a birthday on Sunday, for ME :-) Have a great weekend, see you next week! Test block for my 3x6 blocks - looks great right? Right, except that it's barely 12". *sigh* Back to the calculator. At least I only cut the squares for my test one - I've obviously learned something having been around this block before (HAhaha). Ahem, anyway, I'm upping the size of my blocks and trying again. My fabrics are all picked out and ironed, ready to go. As soon as I get the math right I'll have those blocks sewn in no time! That's my story and I'm sticking with it. So I have to confess I am a wee bit grumpy today - perhaps it's my child who has had a cold/runny nose/cough/ attitude problem for the past week and a half - I mean there is only SO MUCH arguing I can do about putting your shoes on or not squeezing all the juice out of the box onto the couch or getting your hair combed or or or. You get the idea right? I know it's just part of being two but geez, it's making me tired. And grumpy.